As a member of the Knutsford Golf Club, you can learn from Tim Maxwell golf pro and dedicated coach who holds lessons throughout the week. 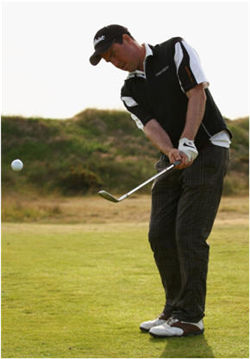 In 2006, Tim was awarded ‘Advanced Professional’ status in recognition of his teaching and coaching knowledge, as well as his playing ability, so you truly are in the best possible hands. Tim has enjoyed a successful golfing career so far winning more than 50 professional events, including the Cheshire Match Play title four times. He has also set records at a number of golf clubs across the country, such as Lancaster (65), Werneth Low (69) and Leasowe (63). In addition to his busy playing schedule, Tim has built up a strong reputation as a golf coach and is available for coaching and guidance at the Knutsford Golf Club. Tim can also offer preferential prices on a range of golf clubs and other equipment on request. “I really enjoy the coaching side of my profession, and I am lucky enough to have worked alongside (and been coached by) some of the best golf coaches in the world. In 2001, I was appointed golf coach for the Manchester United footballers by Sir Alex Ferguson. In 2006 I was awarded Advanced PGA Professional status by the Professional Golfers Association. I regularly attend PGA coaching seminars for my continued professional development to keep abreast with the latest approaches and theories. Most recently I spent a day with Paul Hurrian – putting coach to many tour players including Padraig Harrington, Lee Westwood and Rory McIlroy – to further develop my knowledge of perhaps the most important aspect of the game.